Clean snow in a hurry, whether it’s a blizzard or a flurry! The Auto ProEdge Snow Removal Tool will quickly cut through the layers of snow resting on your car and effectively rake it away. The squeegee-like edge of the Auto ProEdge Snow Removal Tool will easily contour to the surface of your vehicle and provide the most thorough snow removal you’ve ever seen. 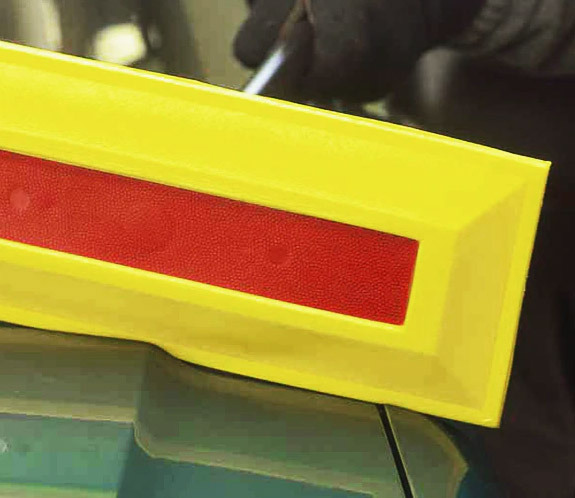 The dense, closed cell polyethylene foam and the powder coated, rolled steel handle gives the Auto ProEdge Snow Removal Tool the endurance necessary to clean your car for years to come. Whether you are dealing with heavy wet snow or just a light dusting, the Auto ProEdge Snow Removal Tool will clear the entirety of your car in mere minutes! Even the most avid lover of the winter months will mostly likely agree that cleaning your car after a snow storm is likely to have you booking a flight to Florida. Unlike the dust that collect on your car in the warmer months, snow cannot simply be rinsed or washed off. Then you would have to deal with the water that is not frozen on your car AND on your driveway. The only way to safely and effectively remove this white plague is to rake it off the surface. The Auto ProEdge Snow Removal Tool makes the process of raking the snow off your car easier than you ever thought it could be. This innovation of the original Sno Brum comes with proprietary features that makes raking the snow off of your car even faster and more effective than before. The Auto ProEdge Snow Removal Tool features a “V” edge-design that will slice through the snow on your car to get all the way down to your vehicle surface! While you are pushing or pull the snow off your car, the squeegee-like edge of the Auto ProEdge Snow Removal Tool will effortlessly conform to every bend and groove of your car. This will ensure that you never miss a single snow-flake. The square corners of the Auto ProEdge Snow Removal Tool allow it to reach into the tighter areas of your car much more easily than other similar products. The 48" rolled steel handle allows you to reach every inch of snow area! If you live in an area that sees a large amount of snow-fall ever winter, chances are that you will be cleaning it off your car frequently. The last thing you need when raking the snow off your car is the head of your snow rake snapping off due to over-use. The Auto ProEdge Snow Removal Tool was designed with a head that is made of dense closed cell, cross link polyethylene foam that will be able to endure years of frequent use. The Powder coated, rolled steel handle and the metal threads that attach it to the head are able to stand up to even the thickest layer of snow.